"Just a short note to say thanks to the staff that attended to our roof repainting. They responded and were on site promptly, did the job in a clean and professional manner. unlike the others whom I contacted in the past. I have no hesitation in recommending your services." "Thank you so much for my roof. A big thanks to Adam for telling me about you guys Our home looks fabulous, with its new painted Roof it looks like new. " "Thank you for the great job on the roof, I have neighbour envy, neighbours have asked about your services and commented on the professionalism of your staff. And happy to say no leaks. Roof looks Great ! " "Thanks to the crew from Reliance roof restorations for the great job they did in restoring our tiled roof and painting our guttering. Their professional work has made a huge difference to the appearance and feel of our home.The restoration was hassle free and done at a very competitive price. " "Reliance roofing did what they promised. The work was done efficiently and on time, and left the area clean and tidy. Craig was more than competitive on price, and I would have no hesitation in recommending Craig to anyone who wanted their roof restored. " For trusted roof painting, the team at Reliance Roof Restoration are the go-to experts for friendly and professional services recommended across the board. If you’re after a beautiful and authentic update to your roof that both stays in keeping with the intended look of your home and offers all the benefits of modernised roofing techniques, Reliance Roof Restoration can provide real solutions for your unique roofing needs. Our roof cleaning is suitable for all roof types and can be carried out using simple and effective procedures. Our machinery is designed to quickly remove lichen and mould growths. These growths occur naturally and on many roofing surfaces, and they can diminish the look of your roof just by being present for a few months. Great results can be seen after an initial clean that removes organic growth, bringing your roof up to a next-to-new finish again. Significantly affected roofing may need a full roof paint. The Reliance Roof Restoration team use only the highest quality roofing paints for fantastic durability and a beautiful finish. Reliance Roof Restoration never skimps on product quality or cuts corners in our procedures. Cutting corners can really compromise the lifespan of your roof and can hack into your pocket unnecessarily. We take the time to do it properly- according to all specifications from the paint producer, which means you always get the very best results. 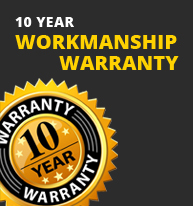 Our Roofing restorations come with an unconditional 10-year warranty. If you’d like to discuss your options in roof restorations today, please feel free to call one of our friendly customer consultants for more information about how we can help you.